ROE-M Series is a commutation encoder which is designed for servo motor. It can not only output the signals of A,B, Z phase but also can detect the U, V, W signals of servo motor for commutation. There are 4, 6, 8, and 10 pairs of magnetic poles for user’s selection. Label Printing Machine, Detecting Machine, Elevator, Auto Bottling Machine, Fixed Length Cutting Machine, Elevator Door. 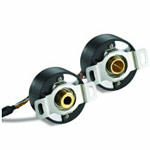 Purchase your Delta ROE-M Series Rotary Optical Encoders today!